Go the Extra Mile for Dad! Give these handsome Nutriance travel essentials this Father’s Day! It’s a one-of-a-kind gift for your one-of-a-kind Dad! Let’s celebrate all Dads for everything they do to keep the family healthy and happy! Treat him to a special Nutriance product pack that includes an exclusive NeoLife Travel Kit! 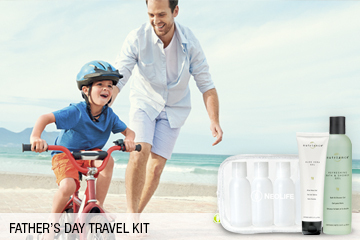 Order your Father’s Day Travel Kit by calling Distributor Services at 800.432.5842 or online at NeoLife.com. Offer ends June 30, 2016 or while supplies last.